This story includes photos I took published by the Oregonian / Oregonlive.com. 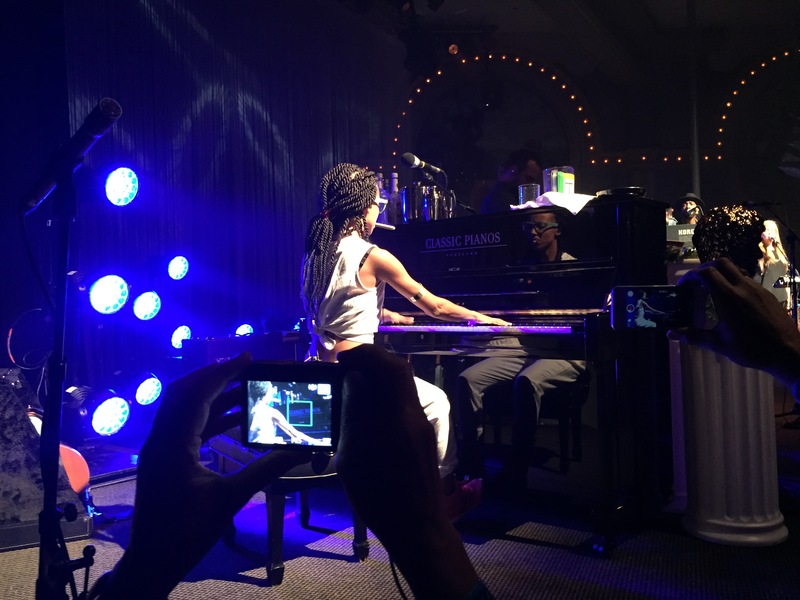 Clad in a white jumpsuit and red hightops, a gold armband and turquoise nerd glasses, Esperanza Spalding returned to her native Portland Tuesday with a challenging new show. This time, she came with fists raised. Playfully. Dressed as “Emily,” the star of the jazz-funk-fusion-poetry-theater piece she calls Emily’s D+ Evolution, Spalding took the stage for her sole encore — Joni Mitchell’s “Help Me” — as a boxer enters the ring, feinting and jabbing, if only for a moment. 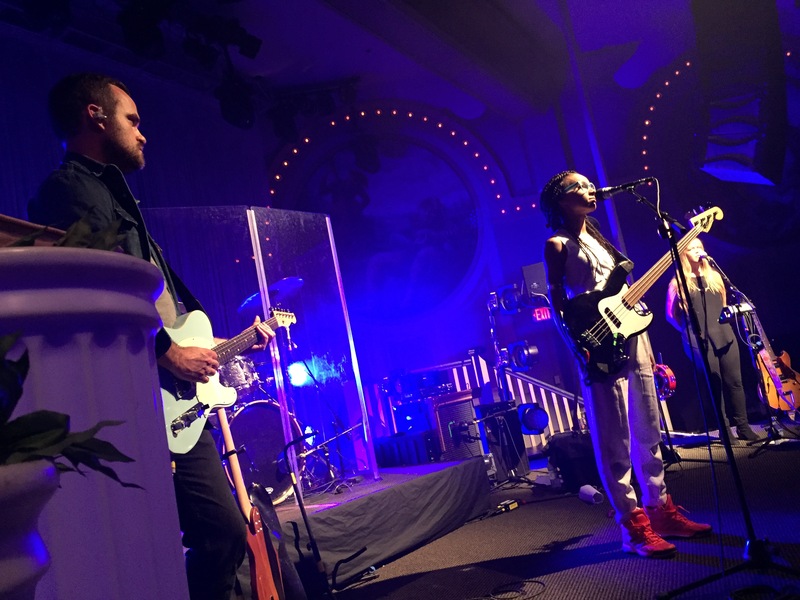 It was a fitting pantomime, one of many moves the diminutive, smiling artist revealed during a virtuosic, challenging, and at times astonishing 75-minute set at the Crystal Ballroom. While the show was modestly attended, the music flowed together and broke apart in glowing, jagged tones, with Spalding’s quintet shifting gears effortlessly. The experience was at once pleasing, groovy, dissonant, progressive and thought provoking; concertgoers rarely danced, but heads bobbed enough to keep local chiropractors busy. “That’s what this show is about,” Spalding said. “You know what? Funk you, man,” she joked. The set started ferociously and ended cathartically, weaving its way down a complicated emotional path. On “Ebony and Ivory,” Spalding, Elbert and King pantomimed a graduation processional, complete with the triumphant reception of diplomas. The piece then morphed into teletype-y spoken word, with all three speaking so quickly as to be impossible to understand, but also impossible not to feel. Then the energy shifted again, into a heavy funk groove. Spalding’s previous incarnation along her path to beating Justin Bieber for the 2011 “Best New Artist” Grammy featured her perched next to a standup bass and performing modern but still traditional jazz. Her ability to take a Big Tent approach to the idiom, bringing in classical and Latin sounds (and languages) such as bossa nova while playing standup and singing like nobody’s business inspired some to anoint her as The Future of Jazz. If she ever was that, Spalding might be even more so now that she’s revealing her rawer side, though there’s a price to be paid: On Tuesday night, the Crystal wasn’t sold out the way it did for her 2012 “Radio Music Society” show. 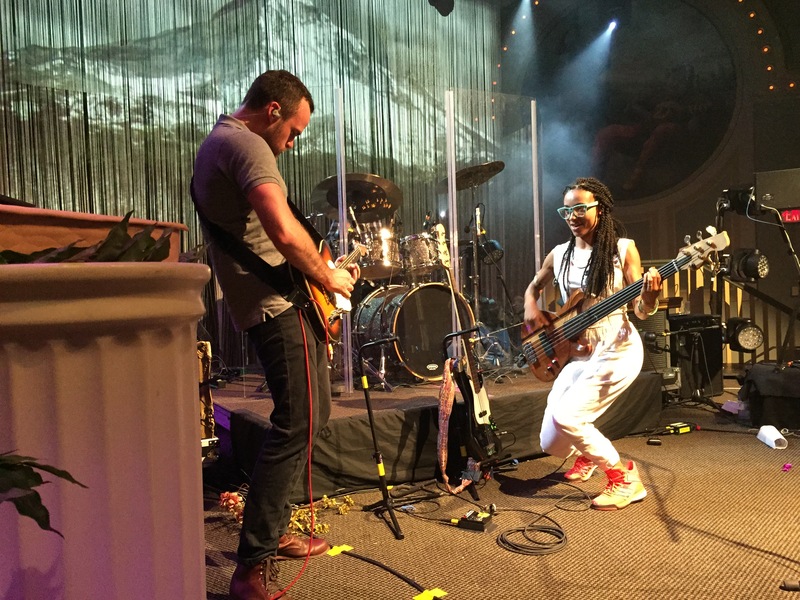 But as Emily, Spalding became an onstage axis between two amazing systems: the first, a power trio featuring her electric bass playing, Matt Stevens’ liquid electric guitar and Justin Tyson’s drums. The second, a trio of voices anchored by Spalding’s soprano, plus Elbert and King’s gospel-inflected vocals. Elbert may have been a recent substitution; Nadia Washington, who sang on shows on the spring leg of the tour, was listed as the fifth member of Spalding’s quintet as recently as mid-July. Washington was not present, but Elbert held down stage left, opposite Spalding, and flowed together with King’s honeyed falsettos — while the trio play-acted with panache. “Honey, don’t interrupt me,” Spalding said with a laugh, pretending to scold Elbert after a beautiful solo. Just as Spalding described Emily’s origins as a “sleepless night of full moon inspiration,” the show waxed and waned like the nearly full moon above. At times the three instruments took over, at others the three singers dominated. Stevens and Spalding fed on each other’s energy, cranking out solos, bebop linguistics and chordal patterns to make an old jazzbo cry. Tyson’s drum solo left it all on stage, too. “No makeup — this is what I look like when I wake up,” Spalding said as she introduced the set’s final song, “Unconditional Love.” Some in the audience cheered. As brash and experimental as the Emily’s D+ Evolution material can be — and there are moments when the show teeters toward self-indulgence — the songs still bear the compositional stamp of a jazz prodigy who thinks like a bassist. And she has some of the most dextrous fingers and adept voices in the business. She may be in the midst of a career evolution, but tunes such as “También Detroit,” “Judas” and “Funk Your Fear” feature melodies that stick in your head — and truths that may stick in your craw.